“According to Ralph Atkins writing in the Financial Times last week, “the pace of Germanyâ€™s recovery is helping dispel fears of a â€œdouble dipâ€ recession across the continent as a result of the crisis over public finances in southern European countries”. Coincidentally, however, on the very same day, Alan Beattie writing from Washington informed us that the IMF feel “the risk of a slowdown in the global economic recovery has risen sharply”. This left me asking myself which is it: is the global recovery a question of up up and away, or are we at the start of a renewed slowdown (whether or not you wish to term this a “double-dip”)? So I thought I would take a look through some of the most recent data (both hard and soft) to see if I could make any sense of the situation”. Strangely, just this week, and nearly 12 months later, I now find myself asking almost the very same question. Naturally I am not alone in this. Here’s a link to ECRI’s Lakshman Achuthan talking with MSNBC’s Tom Roberts about the US May jobs report and the reality of a global industrial slowdown. As Achuthan emphasises, in the US context this is still all about growth, about less growth rather than more growth, since we are not talking about recession, merely slower growth, but at the same time it isn’t simply a “soft-patch” either, since the many “exceptional factors” which are lined up (like supply chain problems following the Japan tsunami, or bad weather in the US) aren’t sufficient on their own to explain the scale of the phenomenon. So it seems reasonably clear that over the months to come – and assuming no additional measures from the Fed – the US economy will grow more slowly and this will be important for job creation and employment, since if the US economy doesn’t attain cruise speed, then it won’t grow fast enough to create new jobs in sufficient quantity to bring employment down, especially given the volume of new young job seekers who are now flowing onto the labour market. It will also have consequences for Europe, and on the sovereign debt crisis, since with so much of the European economy now dependent on exports for growth, any global slowdown will have an immdeiate impact. Core Europe will be inconvenienced, but out on the periphery it will seriously add to the level of pain, and put all those austerity programmes under a lot more pressure. But let’s work back a bit in time: what was the reasoning that lead me to think that we might have been facing a global slowdown this time last year? 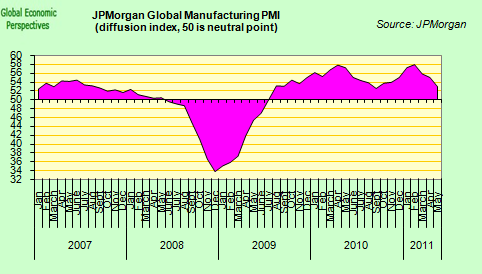 Well let’s look at the global manufacturing PMI chart that I put up at the time. Note the way the rate of output growth had started to turn down. Of course, this is a bit like playing that “guess what happens next” game, only in this case we already know the answer, since this (the chart below) is exactly what happened. Looks a bit like “twin peaks”, doesn’t it? In the end the latent slowdown dragged out a little bit longer, and then things suddenly perked up again. So what exactly happened in the meantime, to apparently so change the course of history? Or was it simply one of those “soft patches” which so often serve to characterise the best of recoveries. Well QE2 happened, that’s what happened, and we got a further lease of life on the recovery. But now, strangely, the rate of increase in manufacturing output has started slowing again, and surely this is no coincidence, it is slowing at exactly the time QE2 is about to expire, just when the issue of whether to go for some sort of QE3 raises its ugly head. Naturally, as the FT’s US economy editor Robin Harding pointed out this weekend, talk of QE3 is the last thing people want to hear about at this point in time, as he says, talk of more stimulus, anywhere, has almost become a taboo topic. We are suffering from crisis fatigue, and simply wish the whole damn thing would go away, but it won’t. The revulsion caused by talk of stimulus is understandable. The tax cuts, spending increases and bank bail-outs used to fight the recession of 2007-09 have left behind huge budget deficits and sovereign debt crises in countries such as Ireland; in the US, UK and Japan interest rates are still at or close to zero. People want to fix these problems and get back to normal, not take more crisis measures. 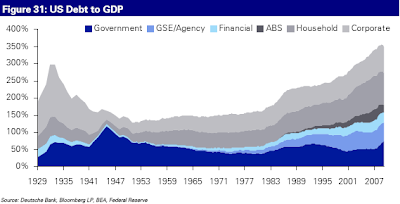 But to rule out all further stimulus would be extremely dangerous. The US economy has run into another â€œsoft patchâ€ with slower growth and a renewed fall in house prices, while the eurozone will soon have to decide on further help for Greece. These problems should not be too serious but crisis fatigue is making them worse. Fear that angry Finns or Germans will block a rescue for Greece, or angry Greeks will refuse the austerity that angry Finns and Germans require, is encouraging market attacks on other vulnerable eurozone countries. Fear that Congress or the Federal Reserve will not step in if things get bad in the US risks creating the pessimism that turns a â€œsoft patchâ€ into a swamp. I think Harding is right. Obviously most ordinary people are by now heartily sick and tired of this whole situation, and want to hear nothing more about bailing out banks, running fiscal deficits, or printing wads of money. But unfortunately simply turning your back on a problem doesn’t make it go away. Let’s remind ourselves what the problem really is. The problem is debt and indebtedness, and in particular private sector debt, in a number of key developed economies (especially the US, The UK and Spain). Somehow or another (possibly we should blame Greece) this whole situation has morphed in people’s heads into a public sector indebtedness problem. Of course, the huge deficits which were created in the initial attempts to fight the crisis helped reinforce this idea, as did the view (propagated by those on the other side of the fiscal stimulus fence) that all that was needed was time, and then the ship would automatically right itself again. But it hasn’t and it won’t. So more is needed, more stimulus (of one kind or another), more imagination and more ingenuity. What isn’t needed is another bout of deficit spending of the kind we have just had, which simply enabled things to mark time, and lots of people to remain in denial. 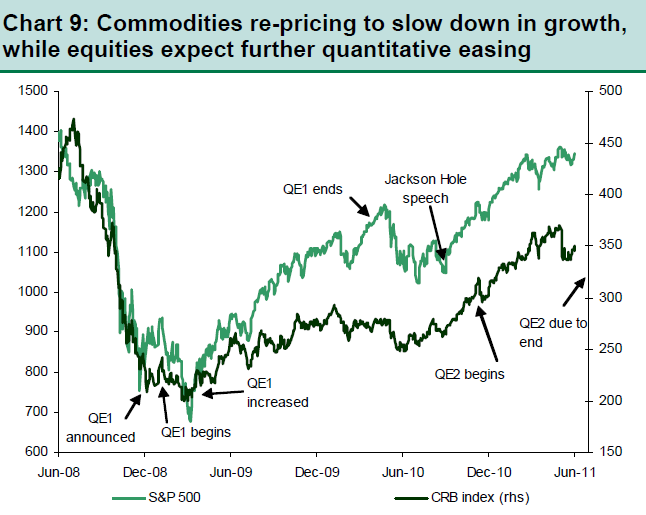 “With equities, credit and commodities all continuing to trade in a range disconnected from weaker economic realities being transmitted via surveys, hard data and the interest rate markets, we arrive at the same conclusion as we have over the last month, primarily that financial assets are fully expecting further quantitative easing if the need arises”. 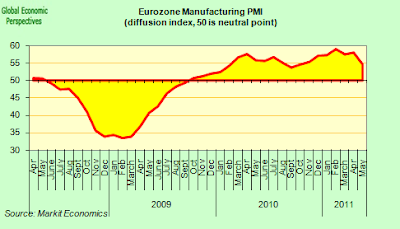 The weaker economic realities they refer to are not only the PMI-Manufacturing data, but also a wider set of variables in countries like the US, the UK and Spain where growth weakness has been pronounced and has been accompanied by a housing double-dip and a worse than expected employment outlook. The fact that the economic backdrop is starting to look eerily similar to the summer of 2008, suggests that central banks rather than wait and watch, start taking out some deflationary insurance, first verbally via dovish talk and then if the need arises with more quantitative easing. Keeping risk premia low is key as that would foster consumer confidence and employment, which have begun to weaken and pose a risk going forward to the financial system. 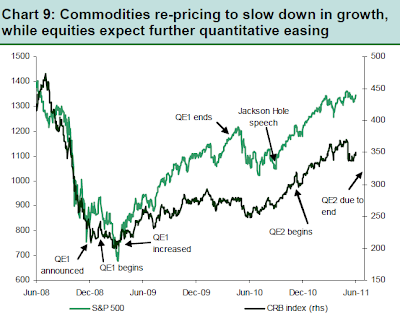 As Chart 9 highlights (see above), commodities (the CRB index) have taken the lead in re-pricing growth just as it did before QE1 ended as well, when equities actually continued to rise well into the close of QE1. The US 10yr yield has fallen below 3%, its lowest level in six months and if the US economy is heading into a soft patch or even worse double-dip, just as was the fear this time last year, market perception of Fed response is increasing. This justifies lower bond yields, but risk assets look to be hanging onto the â€˜hopeâ€™ of QE3 and if history is to repeat, equities may stay elevated till QE2 ends. However, any further deterioration in economic data does not bode well for high beta assets (including HY) in the short term, particularly if Fedâ€™s discomfort level with the economic data is much worse than at present. Citigroup analyst Greg Anderson notices the same trend, namely that of U.S. equity prices rising while bond yields and the dollar are falling a combination they point out was last seen in September and October 2010, just when the market was getting ready for QE2. Either way they point out the looming debate over the U.S. debt ceiling and the slide in U.S. interest rates point towards a weaker dollar (Eurozone Sovereign Debt issues permitting), which means we could see a retest of the dollar at Y80 if bond yields fall further, something which would not exactly be a plus for Japanese recover hopes. 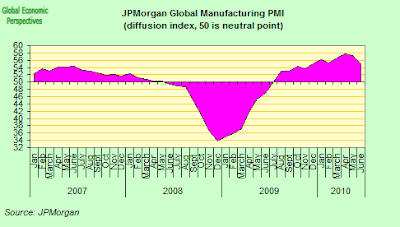 The soft patch of data has brought back speculation about QE3. 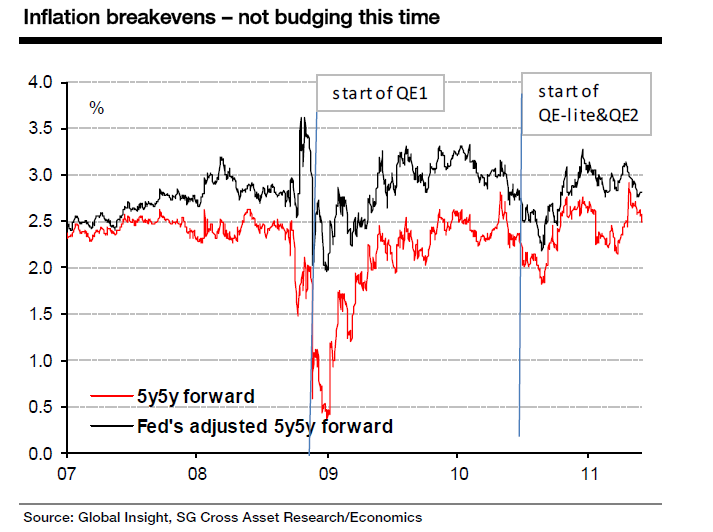 We see QE3 as highly unlikely. In contrast to last yearâ€™s slowdown, the current softness has not pushed down long-term inflation expectations. A downward drift in 5y5y inflation forwards was the precursor of both QE1 and QE2. If thatâ€™s the litmus test for more QE, then we are nowhere near passing it. In the context of higher inflation expectations and diminishing impact of QE on term premiums, the risk-reward trade-off is simply becoming unattractive. The key issue here is seen as inflation, and not growth, and since inflation expectations still haven’t broken downwards, analysts tend to feel the Fed will remain cautions on initiating anything resembling QE3. PNB Paribas’s Julia Coronado rams the point home. The Fedâ€™s reasons for initiating QE2 were that the unemployment rate was rising, core inflation falling, and inflation expectations dropping sharply. We are not in the same circumstance now by a long shot; the unemployment rate has been declining, core inflation is up noticeably from its trough, and while inflation expectations have come off recent highs, they are still toward the higher end of their historical ranges. We are still far from any threshold for QE3, and the Fed will not have much more information when they meet in a few weeks. 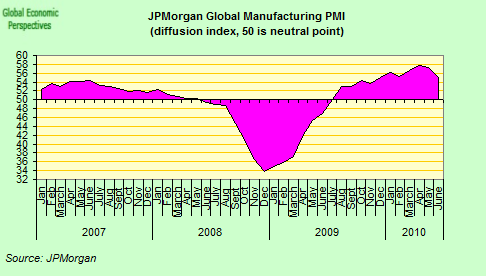 Unlike last year, the US economy will need to muddle through this weak spot on its own as policy makers are tapped out. That only confirms a slower growth reality going forward. Really I don’t buy these latter two arguments, and I don’t buy them for a number of reasons (I am not sure inflation expectations won’t be coming down, indeed I don’t see why they shouldn’t), but number one among them would be the danger of “event risk” in Europe. Basically it is important to understand the global mechanisms that are at work here, and the global implications of local decisions. If the global economy has been growing reasonably well over the last six months it is because what Nouriel Roubini once called a “wall of liquidity” is seeping out of the United States, where solvent domestic demand for credit is flat and will remain flat due to the private indebtedness problem (remember US “over consumption” (the high proportion of GDP which has been consumption driven) has only been the mirror image of Chinese “over investment” and we that live in a world which badly needs to rebalance). This “wall of liquidity” has been force feeding strong growth in a number of key emerging markets, and this growth has been generating strong demand for exports from a number of developed economies, and most particularly from Germany. 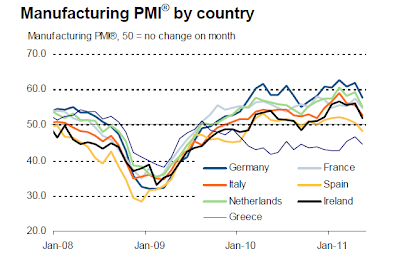 Thus the German boom is no mystery, and has been intimately tied to the implementation of QE2 in the US. 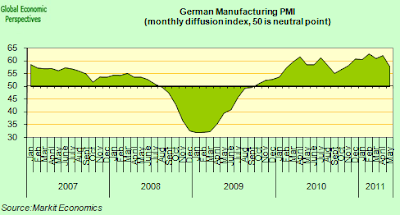 Note, in the chart below, how the German manufacturing PMI was slowing in the summer of 2010, how it surged in the autumn (QE2) and how it is now swooning again. There is no mystery to these “soft spots”, all you need to ask yourself is where the demand is coming from. In fact the Eurozone manufacturing PMI (May) fell sharply in May (to 54.6 following April’s 58.0) giving the lowest reading since October 2010. Just as importantly as the drop in the headline growth rate, the key sub-indices of orders and output both fell exceptionally sharply in May, from 57.4 to 53.3 and from 60.2 to 55.2, respectively. Analysts tend to attribute this drop to a combination of previous increases in commodity prices, the problems in Japan post-earthquake, slower economic growth in China, and ECB policy tightening. And just as importantly, although the ‘core’ countries are still outperforming those in the ‘periphery’, the slowdown is universal. And what hits export dependent Germany hard, hits the weaker export dependent economies like Spain and Italy even harder. 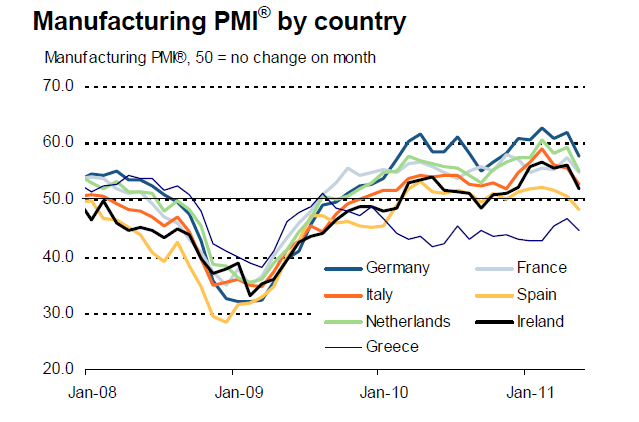 Unsurprisingly Spain showed a reading of 48.2 (indicating the sector had been sent back into contraction), while, more worryingly, in Italy the index fell precipitously to 52 (well down from the 59.0 high in February). So what may only turn out to be a “soft patch” in the US or Germany, could easily turn into full blown recessions along Europe’s periphery, and herein lies the danger, since the risks of a serious worsening of the sovereign debt crisis on the back of such recessions is all to evident. Maybe it seems peculiar to be arguing that policy in the Federal Reserve should be partially conditioned by policy failures in countries like Italy, Spain and Greece, but such is the nature of the inter-connected world we live in. Certainly Europe needs to get its act together, and to start sorting its mess out to get the rest of the world back from the precipice. As Robin Harding so eloquently reminds us, “the rich worldâ€™s recovery from the Great Recession began two years ago. It is dispiriting that we still face sovereign debt crises and soft patches. But just as a war is more likely to be lost from a collapse in morale than a defeat on the battlefield, the only way that the world economy is likely to succumb to another recession is if policymakers lose the will to fight it”. we are swamped in debt and headed for a global slowdown..
Until private business can see a light at the end of the tunnel, we won’t see any growth. This light will glow dimly until the debt the consumer has taken on, works it’s way out through the system. If you look at the period prior to the Great Depression, everybody was hocking themselves. What scares me is the fact we have a potential world power play in motion. If the world economy tanks and the general population in the street wants an immediate answer, what then? China is the Elephant in the Room, and could morph into the Bull in the China Shop. If the USA can not stop the Taliban, hnow can they stop the Chinese if they go onto the war path? I love my economic and millitary history, and they all have one thing in common. The general population angry and wanting answers. Lets hope we don’t have a Facist rise in China.